While I was there helping Andrew take photographs and generally soaking in the ambience of the information booths, placards, live musicians, and ad hoc lending libraries, I happened to look skyward to the uppermost spire of Philadelphia’s City Hall, upon which stands the statue of Benjamin Franklin, the man whose stature in the Eighteenth century was such that his mere affiliation with both the Declaration of Independence and the American Revolution gave them instant international credibility. At that time I wondered how Franklin, the man who so famously said, “we must, indeed, all hang together or, most assuredly, we shall all hang separately,” would think and feel about what these people were doing at the foot of this grand memorial. Would he have approved of the new “Occupation” movement, and seen it as reflecting the spirit of the ‘76, or would he dismiss it as the actions of a group of misguided malcontents? I don’t know the answer, but I couldn’t help but feel a certain visceral symbolism going on around me, as an icon of US history was forced to gaze down upon what the fading of the American Dream had wrought. 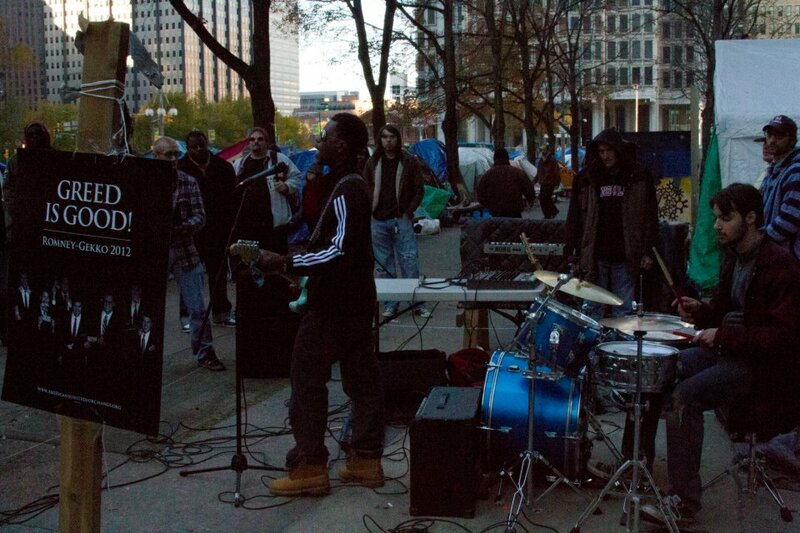 A live musical performance at Occupy Philly. Photo by Andrew Golledge. For my part, it was a sobering experience. To be clear, I haven’t agreed with all of the tactics (or occasional lack thereof) used by some of the Occupiers, and certainly not with the image they’ve sometimes presented. I also definitely don’t agree with the fringe agendas that have been trying to co-opt the movement for their own ideals (I’m looking at you, libertarians). With that said, I’m pleased that they’ve called attention to many of the core problems in our society and have expressed, on a national and global stage, the deeply held anger, shared by me, about the economic injustices that have kept this country mired in a recession. For that, they have my respect, my sympathy, and my emotional support. 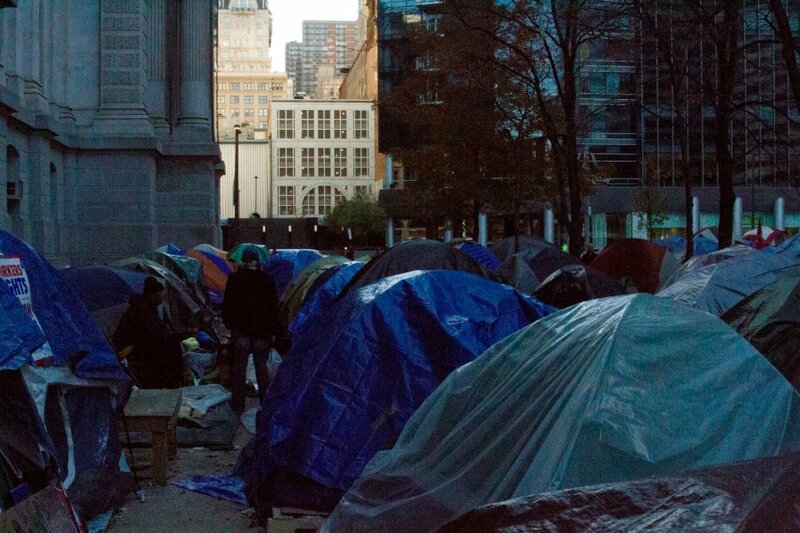 Yet, I still felt conflicted, and that conflict was on my mind as I walked around the Occupy Philly site and witnessed what was clearly an awkward mixture of earnest social defiance and self-imposed squalor, and hung with me as I made the long drive home that evening. Having been on the road for a few days at that point, I had honestly lost track of the date, and it wasn’t until I arrived home and had gone on the Internet that I realized, with some significance, that the date was November 5, or the Fifth of November. Guy Fawkes Day. If you’re not aware, Guy Fawkes Day commemorates, somewhat ironically, the foiling in 1605 of the Gunpowder Plot, a scheme hatched by aggrieved Catholics to blow up the House of Lords and murder the English king James the First as a prelude to a coup. Fawkes, though not the leader of the insurrectionists, was the most famous of them; placed in charge of triggering the explosion and the first of the conspirators captured, Fawkes and his image, typically burned in effigy in certain parts of England on November 5, are well known in British cultural lore. 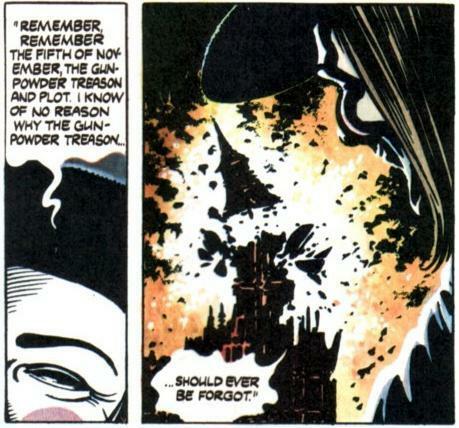 In more recent global popular culture, the Fifth of November and its significance to Fawkes and the Gunpowder Plot is probably better known for its incorporation into the acclaimed graphic novel V for Vendetta and its very popular 2006 film adaptation. Having realized it was the Fifth of November, and with the Occupy Wall Street movement fresh on my mind, I took my copy of the graphic novel off the shelf and gave it a read through before going to sleep that night. The next afternoon, I watched the film again. As they always do, the narrative content of each caused me to think, this time about Occupy Wall Street, and helped me crystallize some of my own feelings about both the movement and the state of our country going forward. 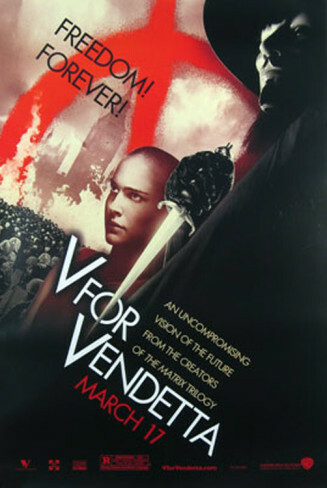 The first issue of V for Vendetta as published in the United States. The movie poster for V for Vendetta (2006). 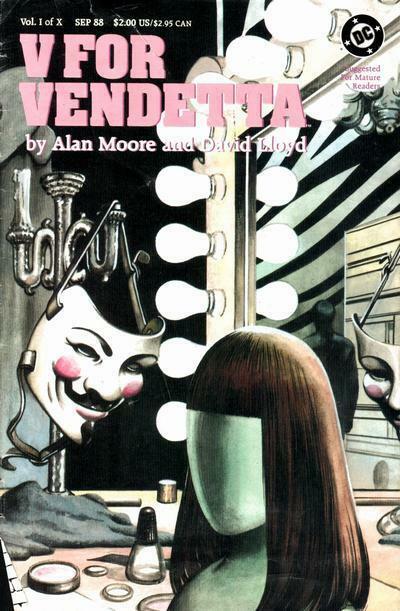 Writer Alan Moore and illustrator David Lloyd’s V for Vendetta stands, more than 20 years after its completion, as one of the masterpieces of comics media. Its core legacy, as it was with Moore’s work on Watchmen, was in enhancing the perception of comics in general and engendering an audience for more mature, adult-themed graphic novels, some of which could be held in the same company wiyh the best literary works of their era. 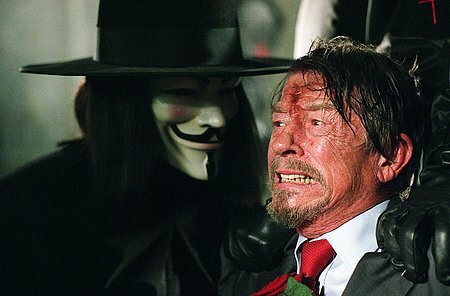 In my opinion, V for Vendetta certainly deserves that vaunted status; of the film version, however, I’m less certain. Having seen the film, which was directed by James McTeigue and adapted by the Wachowski Brothers, many times, I tend to vacillate in my opinion of its import; sometimes I perceive it as a modern classic within some of the new millennium’s excellent comic book films, and at other times I’ve seen it as something of an over-stylized simulacrum of the original work. From a qualitative perspective alone, however, I rate it as an undeniably strong, compelling, and entertaining film that stands as a worthy adaption of the classic graphic novel. 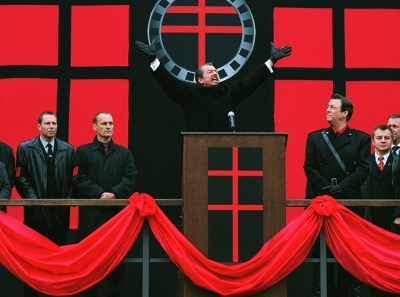 Both the novel and film of V for Vendetta are set in an isolated Great Britain, one ruled by a fascist police state on a near-future Earth decimated by cataclysmic events. Predominantly, it tells the story of a mysterious figure named “V,” an urban revolutionary in an imitation Fawkesian mask, and his battle to topple the oppressive regime that has left his country a ruin. Though he often appears as a vigilante with a theatrical flair in the mold of most costumed superheroes (and in the eyes of the fascists, a terrorist), V represents something far more complex. Instead of the typically reactive hero, V is a political freedom fighter with a very specific agenda; a brilliant strategist, military tactician, deadly combatant, and genius intellect, V’s purpose is to do more than simply wage a guerilla war against the ruling fascist party, called Norsefire, but “to scour its ideology.” In both versions of the story, through brilliant media manipulation and political maneuvering, V manages to destroy Norsefire and restore England back to its people, though he does so without living to see the fruits of his labors, leaving behind him a new Britain that has the freedom, for good or ill, to make its own decisions about its future. Shortly before his ultimate "victory," V (Hugo Weaving) comes face to face with the leader of Norsefire, Sutler (John Hurt). 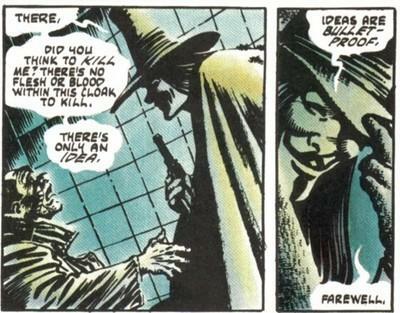 Though both the graphic novel and film of V for Vendetta share a great many plot elements and more than a few themes in common, they are actually fundamentally different texts. The original comic was published first by the long-defunct UK publication Warrior in the early 1980s, and then in the United States by DC Comics’ Vertigo imprint later in the decade. In the film: V after defacing one of Norsefire's propoganda posters. 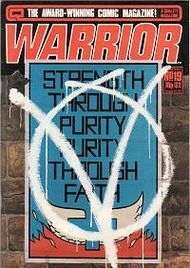 One of the original UK covers of V for Vendetta as it appeared in "Warrior." 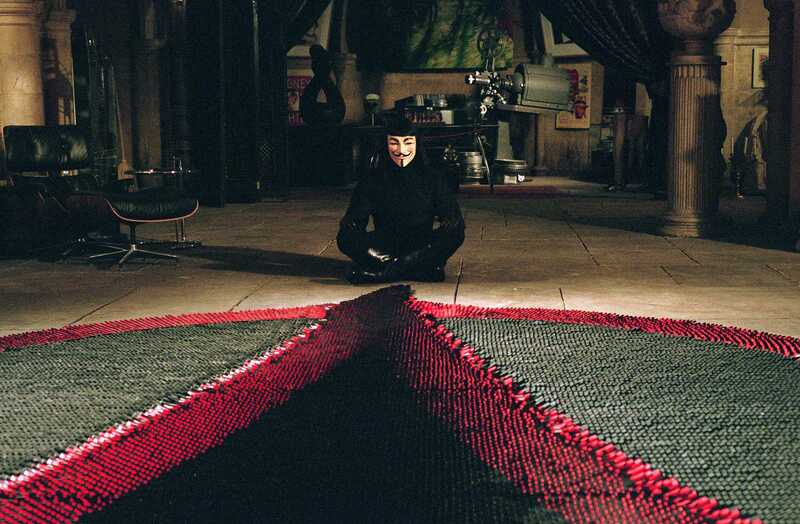 Moore crafted the original V for Vendetta as something of a cautionary response to the strict conservative atmosphere that accompanied Margaret Thatcher’s reign as British Prime Minister. Defined by its fierce air of nationalism, the Thatcher era fostered what proved to be a hostile public atmosphere toward immigrants, people of color, and those who lived alternate lifestyles, namely members of the gay and lesbian community. The Norsefire Party of the novel was likely inspired by the well-known, if short-lived, British fascist political party called the National Front, which was largely absorbed by Thatcher’s Conservative Party shortly before her ascension to 10 Downing Street in 1979. The fascist Norsefire, with its memorable motto of “England Prevails,” was itself defined by carrying through to the utmost evil the hostilities that informed the dark underside of Thatcherism, having eradicated, through secret police and concentration camps, liberal dissidents, political activists, homosexuals, people of color, and immigrants on its way to establishing a “proper,” Anglican Christian English society. "England prevails." One of Norsefire's rallies from the film version. The film version, though still set in Great Britain, owes far more to the post-9/11 era of American consciousness, standing as something of a pro-liberal response to the “dark side” abuses of conservative government that defined the Bush-Cheney Presidency, the One Percent (Bush) Doctrine, and the War on Terror, with imagery reminiscent of the Abu Gharib scandals, renditions, and state-sponsored enhanced interrogations (torture). Alan Moore, a contentious personality when it comes to adaptations of his work, was so displeased by the ideological differences between the film and the graphic novel that he kept his name off the film (only David Lloyd, the illustrator, is listed in the film’s credits). The character V dons his signature mask at the beginning of the film. For V, the mask does not hide his identity - it is his identity. "Ideas are bulletproof..." A concept presently referenced within the Occupation movement with the mantra: "You can't evict an idea." V’s an intellectual and cultured vigilante of the highest order: extremely well read, highly eloquent, and an authority on philosophy, history, and culture. Though his final plot against Norsefire differs in each work, both are acts of meticulous planning and calculation that transpire precisely as he plans them to and without complications. V essentially turns the inherent weaknesses of the regime – the deceit, cronyism, bigotry, and popular resentment by the masses that are emblematic of fascist power structures – against it, causing Norsefire to collapse inward on itself. V knocks down an ornate arrangement of dominoes. In both film and comic, the dominoes served as a metaphor for the precarious nature of the regime, with V's plot symbolized by his knocking them over in proper order so as to acheive the maximum effect. Simultaneously, he galvanizes the people to action, making them aware of their present state as the oppressed and causing them to question the role they have accepted in their society. 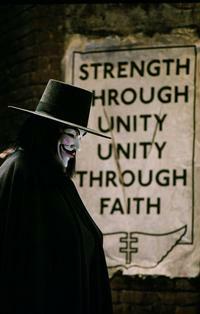 In the film, his plan culminates through his carrying through on Fawkes’s original plot to blow up the Houses of Parliament on the Fifth of November. 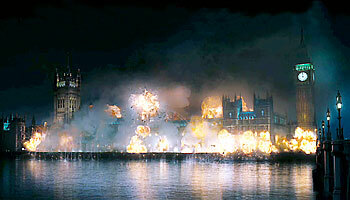 V's symbolic act of destruction - destroying the Houses of Parliament. 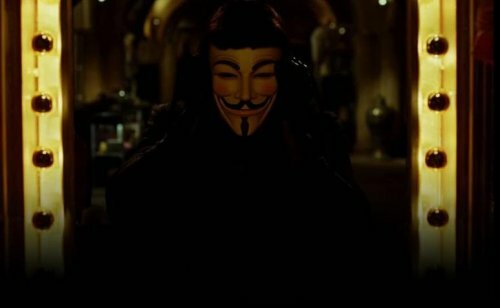 In one of the film’s most memorable sequences, much of the population of London, their identities concealed by wearing identical Fawkesian masks in solidarity with V, convene upon the Parliament building. Standing against them are the heavily armed British military, waiting for orders from their party leaders about how to react to the mob, nearly all of whom are unarmed. With no orders forthcoming, the soldiers lay down their arms and the citizenry proceed to Parliament, to watch in awe as the once-dominating power structure goes up in flames due to V’s symbolic act of destruction. The citizens of London showing solidarity with the "extremist" V; this scene is one that members of mask-wearing members of the Occupy movement have certainly tried to evoke. 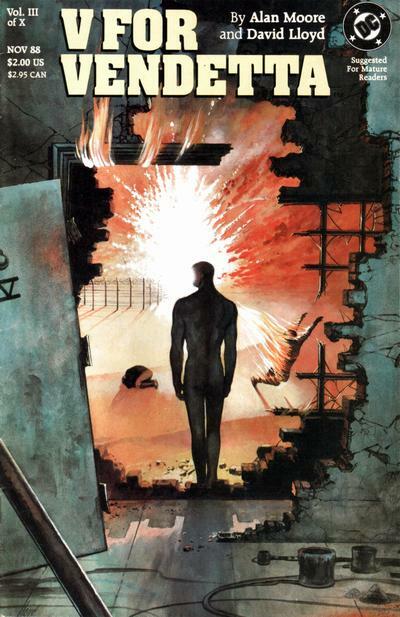 Issue 3 of V for Vendetta, depicting V's original escape from Norsefire's concentration camp. Regardless of the debatable ideologies of each work, V is consistently coded in both as a liberal avenger fighting against a militant right wing regime that, ironically, is responsible for his creation. Formerly one of the country’s undesirables, V was a prisoner at a concentration camp, and the only surviving test subject of a program of grotesque human experimentation. The experiments horribly scarred his entire body, yet ironically gave V his enhanced mental and physical prowess. As the direct result of Norsefire’s crimes against humanity, V becomes, as he states in the film, “the reaction” to their “monstrous” actions. Just as the title states, V’s crusade is a true vendetta: a systematic pogrom of absolute vengeance constructed and conspired to be the ultimate antithetical response to the actions and ideals of the Norsefire regime. What the novel makes clear is that V is a political anarchist, which Moore viewed, but did not necessarily endorse, as the opposite reaction to true fascism; the absence of a state in the face of a completely hegemonic master state. V’s death, though established quite differently in each text (to the point where they both have completely different contexts), is in neither a true heroic sacrifice, and for practical narrative purposes seems almost unnecessary. 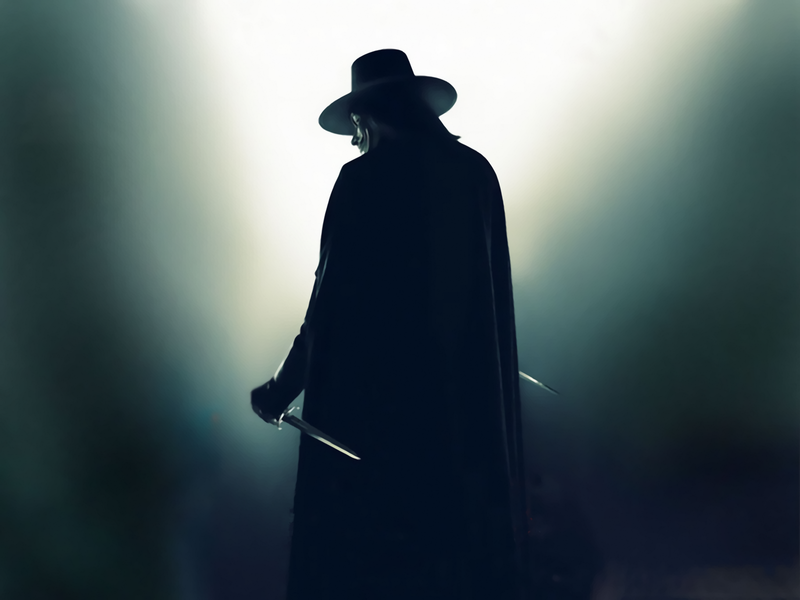 In the film, V makes his final stand. Yet as the film makes explicitly obvious, V realizes that as the counterbalance to Norsefire, he has no place in the new world he’s fighting for. V is essentially a figure of exception, as postulated by Italian philosopher Giorgio Agamben, one who can only exist and operate outside the boundaries of society when the rule of society itself cannot address the threats that are posed to it. Essentially, the social contract, the one between the state and its citizens, is found to be breached, and when breached, there comes the need for the exceptional figure to fill the void. In both instances, V must die when he becomes unnecessary, so the world he hopes will come to pass can ultimately do so, free of the very kind of extremism that he, as the living idea of the exception, and Norsefire both represent. "Give me a viking funeral...ave...atque..vale..." V must perish so the new world he fights for might come to pass. 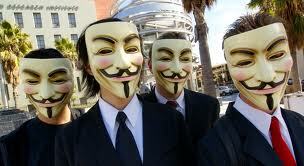 Members of the hacker collective Anonymous protesting the Church of Scientology in Los Angeles, CA in January of 2008. The film V for Vendetta, and especially its version of the Guy Fawkes mask, has had a pronounced footprint in the world of activist culture. The very well-publicized hacker collective Anonymous has, in recent years, appropriated the mask and used it as both a symbol and as a way for its members to hide their identity when protesting in public. 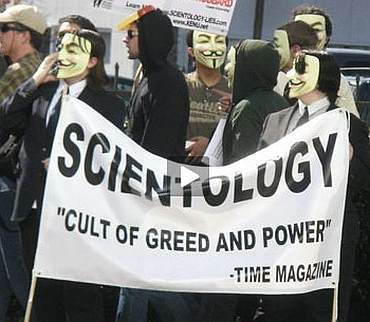 Perhaps the most memorable example of this was the Project Chanology protests of 2008, where members and supporters of Anonymous staged protests outside the worldwide branches of the controversial Church of Scientology in response to its attempts to obfuscate its agenda and its history of ruthless “fair game” tactics against its opponents and critics. Another image from one of the Project Chanology protests from January 2008. V’s mask has also, as the weeks and months of the Occupy Wall Street movement have progressed, become a prominent symbol at the various protests and Occupation sites. While at Occupy Philly I saw at least three people wearing one, including a fiercely anti-big government Libertarian. Sales of licensed V for Vendetta Fawkes masks have apparently skyrocketed since the protests began, which some have noted, ironically, only supports the Time Warner Corporation that owns the V for Vendetta franchise. 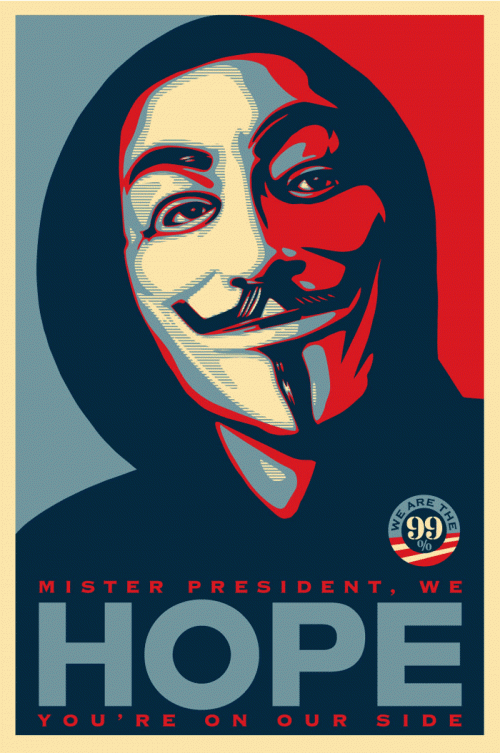 Of course, with the release of Shepherd Fairey’s new “HOPE” poster, pictured above, the mask is now, for better or worse, an indelible symbol of the movement. 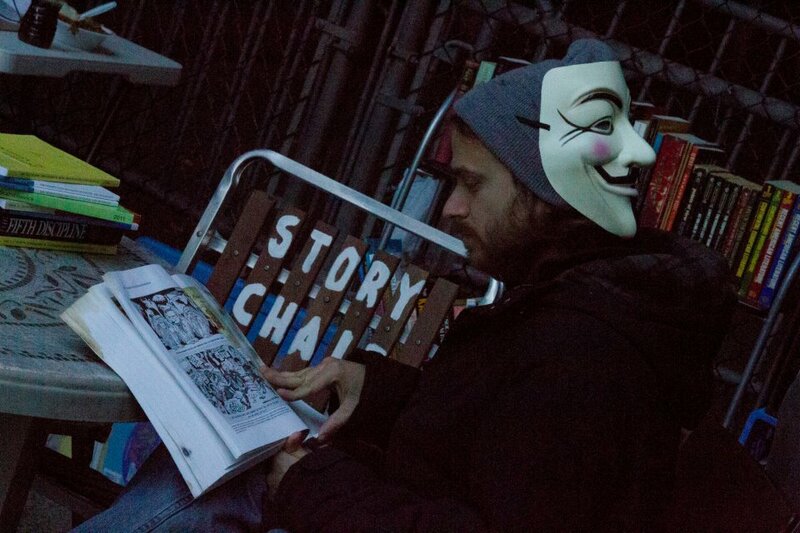 An activist, wearing the V for Vendetta Guy Fawkes mask, utilizing the library area at Occupy Philly. Photo by Andrew Golledge. For me, however, it was in reviewing the themes of media manipulation and extremism present in the narrative of V for Vendetta that interested me far more than the occasional appropriation of the mask by members of the movement. I personally think the use of the mask actually does more harm than good; its effectiveness in the comic and film is based on it being almost ominous, which inversely, I think, can undermine an activist’s message when used in the real world. 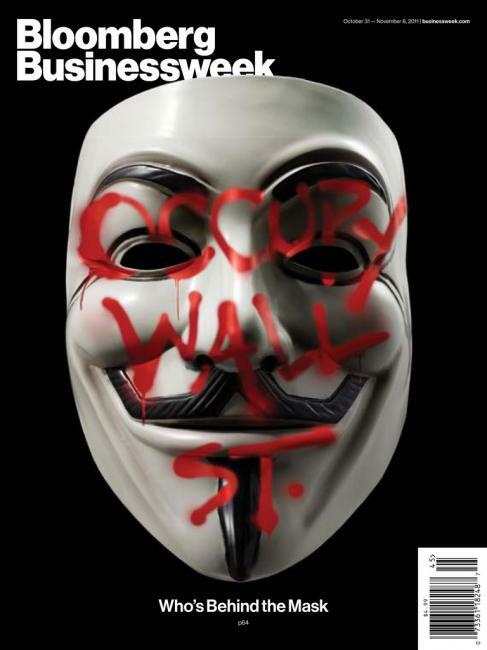 The cover of Bloomberg Businessweek from last month, which utilizes V's Fawkes mask to present Occupy Wall Street as an ominous force. Given both who owns the magazine and what happened in Zucotti Park two weeks ago, this presentation seems ominous in an entirely different way. To the point of media manipulation, as I’ve mentioned above, I think Occupy Wall Street has unfortunately done a rather mediocre job of portraying themselves in the most positive light, especially when it comes to counteracting the basic fact that both the conservative and neoliberal branches of the media were going to look for any chance to portray them as the lunatic fringe. Besides the utter mishmash of ideologies and goals on display at the various Occupation sites, the images presented by some Occupiers have been unpleasant at worst and isolationist at best. The unpleasantness derives simply from the movement embracing the image of squalor and destitution. I understand the reasoning: by assuming the trappings of homelessness the movement largely feels that it can be seen as showing solidarity with those who have endured the hardships of modern economic conditions. Yet that reasoning is terribly flawed and even patronizing, as the images of unsanitary squalor are just not representative of the economically disenfranchised in this country (it is, in fact, their nightmare). As a result, the unsanitary tent cities have really only made the Occupiers a target for those who view their occupations as detriments to public health and safety, and have subsequently given rise to such designations as “the Flea Party.” The group also gives off the perception of being highly esoteric, based on validating some of the most ludicrous of left wing stereotypes, such as the ironic hand gestures and drum circles, which have only blunted the effectiveness of their most potent piece of propaganda, the “99% vs. 1%” concept, by allowing the entire movement appear more as a fringe gathering than a representative of the universal majority. The fact that the Occupiers have allowed themselves to be manipulated by the conservative media, falling into the trap of being asked to provide demands, thus casting them in the role of extortionists and hostage takers, and attempting to actually write policy, in essence, trying to write their Constitution before even clarifying their grievances and philosophy within a Declaration, has also demonstrated their naivete and cost them credibility among those people, including me, who want to see their message succeed. In many respects, they have sometimes shown a clear tendency of following in the footsteps of Anonymous, whose movement, along with the Iranian Green Revolution and the Arab Spring, was a clear antecedent of OWS. Anonymous, regardless of how one feels about their original intentions, married themselves to extreme idealogies and illegal tactics, and their subsequent continuation of these tactics against what many would label as issues of clear legal standing (like intellectual property rights) and figures like Julian Assange of Wikileaks (and to be fair, actions taken by lone individuals and groups appropriating their collective’s name) have only marginalized them from the mainstream, and have recast the conversation about Anonymous as more about their methods than their ideas. 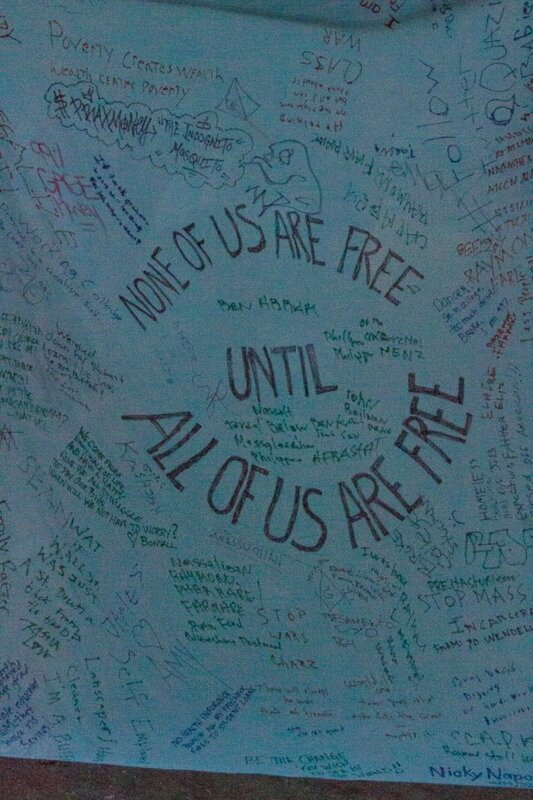 One of the murals from Occupy Philly. Photo by Andrew Golledge. It has only been in recent weeks, through the shameful violence inflicted upon it by members of law enforcement in places like Oakland, Portland, Berkeley, UC Davis, and New York City that the movement has appeared appropriately galvanized and refocused again, forced out of their modern era “Hipster Hoovervilles” and back onto the streets and engaging in active protest. According to an article in The New York Times, the protesters have evoked the mantra “you can’t evict an idea;” reminiscent, certainly, of V’s “ideas are bulletproof” concept. Still, their portrayal in the media remains a problematic one, as does their lack of a unified voice. In many respects, I almost wish they had someone like a V – not the V that represents ruthless and violent vigilantism, who commits acts of destruction and terrorism, but the unifying individual who can capably state their singular agenda they hold as true to their cause. By avoiding this out of an obtuse desire to represent “the majority” (which in turn, means only themselves), OWS has been getting mired in their hand gestures and divergent agendas. I have made, before now, comparisons to the American Revolution, and this has been by design; the ideological underpinnings for the War for Independence, now recognized as the bedrock for our nation, were crafted by an assortment of the greatest exemplars of the fledgling nation. In contrast, Occupy Wall Street has attempted to satisfy their need to remain on message with what feels like a cacophony of confused ideas, some of which have been very well articulated by some individuals representing the movement, and less so by others. There are obviously great ideas there that are shared by many of the Occupiers, such as the reinstatement of the Glass-Steagal Act, but the fact is, they’re not being articulated. What the movement needs is something akin to V’s vendetta; a formulated method of clarifying and enacting its agenda, and one that also simultaneously undermines the extreme national condition that they oppose. 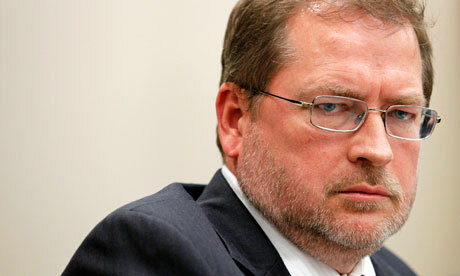 Grover Norquist, leader of American for Tax Reform and one of leading causes of the GOP tax cutting over the past decade. America’s wealthiest people, whichhave increased the burden on the middle classes and caused federal and state deficits to spiral out of control (and being fair, the Democrats allowed it happen and are still allowing it to happen). All the while, Wall Street committed fraud on a global scale, and corporate America, through its control of special interests, essentially bought our politicians, whose first obligation is now to their corporate masters instead of to their citizens. Most sinister to me, though, is that despite all of this, the Right has been painfully effective in convincing many people that what they want is best for all. As the leader of Norsefire, Sutler, states to the other party bosses in the V for Vendetta film, “they (the people) must remember why they need us!” The Republicans, their corporate masters, and both the conservative and neoliberal media do that every day, forcing a retrograde agenda that has strangled our economy and kept our society in a perpetual financial chokehold. If, as a result of being the counter-reaction, the Occupation Movement has gone too far toward being esoterically left wing at the start, I am willing to forgive it for that. For me, that simply means that we are witnessing the beginnings of genuine opposition to the actions of Wall Street and the GOP; the obvious response, the antithetical extreme to the objectivist excesses that have crippled our economic and societal development. If OWS is to be ultimately successful, it must become a better organized, more effective movement to combat the manipulative, powerful regime that has supported the rich while the rest of America has watched their expectations die. It must become a vendetta, a nonviolent one, of course, enacted against the vendetta that has been inflicted on the middle and working classes for far too long. And to succeed, OWS must continue to expose and exploit the obvious practical, ethical, and moral flaws that are inherent in its opposite number. The violence exhibited on the Occupiers by police around the country, unconscionable and disturbing as it has been, is actually something of a good start. I would be lying if I said these crackdowns didn’t remind me of the finale of V for Vedetta film, where the military allowed the protestors to march upon Parliament. Watching the NYPD two weeks ago block thousands of protesters from marching upon a similar symbol, the financial firms and stock exchanges of Wall Street, by using the threat, intermittently acted upon, of violent action, it illustrated that there is still a very, very long journey ahead of us all. 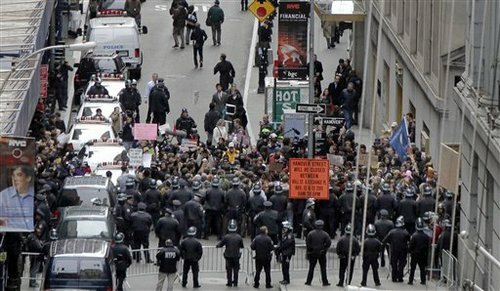 NYPD blocking Occupy Wall Street protesters from converging on Wall Street, a stark contrast to the finale of V for Vendetta. For the companion piece to this article, “Radical Failure: A Transmetropolitan View of Occupy Wall Street” by Andrew Golledge, click here. Posted on December 2, 2011, in The Antiscribe Analyzes (Essays) and tagged fawkes, mask, occupation, occupy wall street, ows, v for vendetta. Bookmark the permalink. Leave a comment.